Auction held onsite @ the N. end of Chapel Heights Rd. Marion Rd. 43302, signs off Pole Lane Rd. across from Marion Co. Airport. Selling by order of the River Valley School Board. 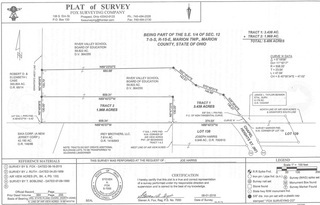 Located in Marion Twp., River Valley School District being 5.406+/- acres of vacant land (2 tracts) with mature trees and open maintained lot at front of property with 60’ frontage at the dead-end portions of Chapel Heights Rd., property is bordered by ditch on N. side and Grave Ditch cutting through rear of property. This is an excellent semi-secluded, low traffic property for building a possible home or just use for recreational purposes, only minutes from town and SR 23 access. Property is being split from Auditors Parcel #200010008200. Sells in as-is condition. Taxes to be determined. Terms: $3,000 down (non-refundable) with balance due in 45 days. 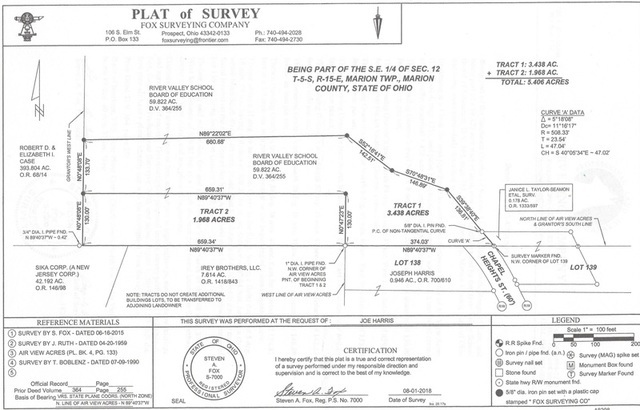 River Valley School Board reserves the right to accept or reject the final bid.